I got off the 110 at Slauson Ave and there she was, a taco wagon parked on a patch of dirt next to a 76 gas station. Initially I was planning on hitting up a taco truck at Broadway and Slauson but when the taco gods hand you a gift you don’t look the gift horse in the mouth. You pour some salsa roja and squeeze some lime on it and eat it. I like that they were parked on dirt. I don’t know why but it made me feel more relaxed. Oh I know why it made me feel more relaxed. I happened to be listening to NPR Science Fridaywhen they discussed how soft surfaces make you a more relaxed and make you a more submissive negotiator. The science is all there, even car dealerships make potential buyers sit in super soft chairs because it makes them less aggressive in negotiating. If the taquero knew about this science I’m sure he could have gotten more out of me than the $1.25 a taco. The tortillas were hecha a mano and I don’t think I’ve ever had a bad taco on tortillas hecha a mano. I think you could probably serve road kill on tortillas hecha a mano and people would say- well the meat was a little weird but the tortillas really made the taco. Kind of like how a rug can really tie a room together. The tacos were good, not great. 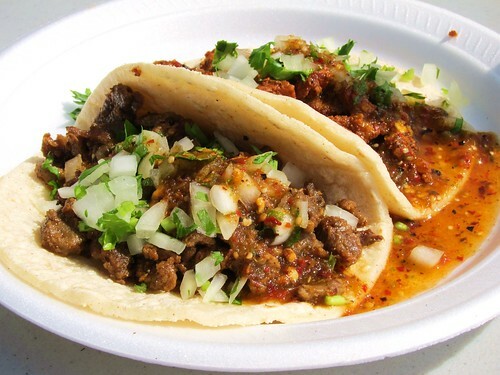 Great tacos have everything going for them(meat, salsa, tortilla). With these tacos the tortillas were great, the salsa was just good and the meat was just good. Ahh can I be a little more vague?! Ok the beef was tender which is good, a little greasy which is good and had a lot of flavor which is great. The al pastor had a strong chile rub which is ok, it was not cut from the spit which is bad but there were no fatty bits which is great and like I said when you have great tortillas your tacos will be good. Another plus was that these were big filling tacos and they don’t skimp on the meat. My favorite beverage to enjoy with tacos is hands down Jarritos. Some say Mexican coke is the best beverage for a plate of tacos. I find coke in general to be too harsh. I like the crispness and pop of a bottle of Jarritos to counter a spicy salsa roja. 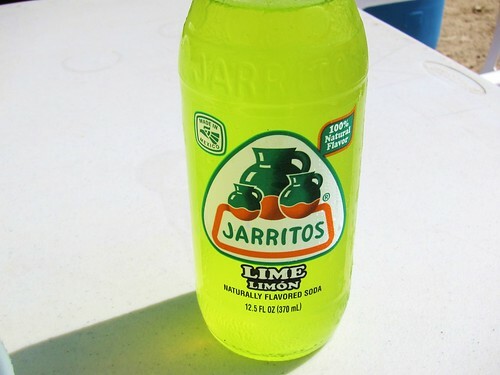 As many of you know that have read this blog my favorite Jarritos is lime. I talk about Lime Jarritos so often I should be a paid spokesperson. Hey what the fruit why aren’t I? 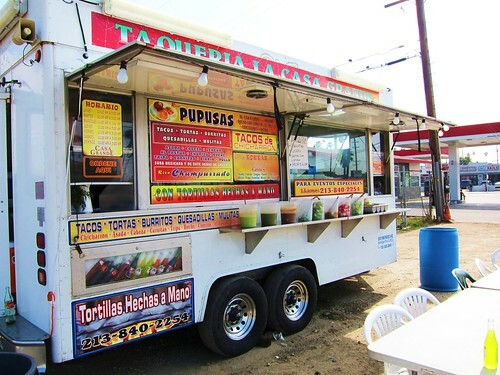 You don’t find many taco trucks in LA that sell pupusas. This great Salvadorian treat can be delicious when made right but I’ve had my share of dry average pupusas in LA. If anyone knows where to get the best pupusa don’t keep it a secret. 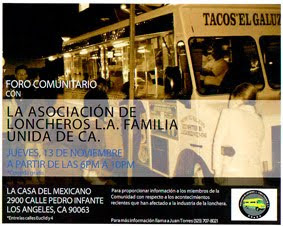 Let your humble taco correspondent in on the secret. While the tacos were just good the experience was great . I dunno but there is something to be said about sitting on a plastic white chair at a plastic white table on a dirt patch just off the 110 freeway on Slauson on a Saturday afternoon with a bottle of lime Jarritos and a plate of tacos. Short of getting roadkill in my taco I was going to be happy. I've only had pupusas a couple of times but the best ones I've had so far came from the pupusa stand in the grand central market in downtown between hill and broadway. Its called Sarita's Pupuseria and they have a pretty big list of pupusa fillings. That's what taco eating is all about. I find your Jarritos/Mexican Coke theory interesting. Mexican Coke is harsh which is part of the addiction of it I guess, but maybe it does do the taco a disservice. I'll have to experiment and give both pairings the scientific focus they deserve. Haha. Have you had the Jarritos Mineragua? That stuff is much harsher than the sodas, but I'm into it. That's a incredibly delicious looking dish!